down early and Lee brought Aunt Ellen with him. The folks all went home at four oclock. I churned, got supper and did the evening work. Friday October 22nd 1897 I did baking and got the butter ready that Will took it to town this morning. I went over to Callies in the afternoon to help with her quilt she had quite a large company. I did the evening work and sewed a little. Pete quit work with [illeg] [illeg] Saturday October 23rd 1897 I got my work done, the boys dinner fixed so they could [it?] and went over to Emmas to go down to Adas to the quilting with her. We had a very pleasant day. I did the work in the evening and we went to bed early. Sunday October 24th 1897 We got the work done and went to town. I stopped at church and then we went over to Marys to dinner. She was better and able to be up today. She has been sick since Sunday night. we stopped at home and at Otts a little while. Lee and Mother had gone to Mr Ada's funeral. we got home in time to do the evening work. weather very pleasant. 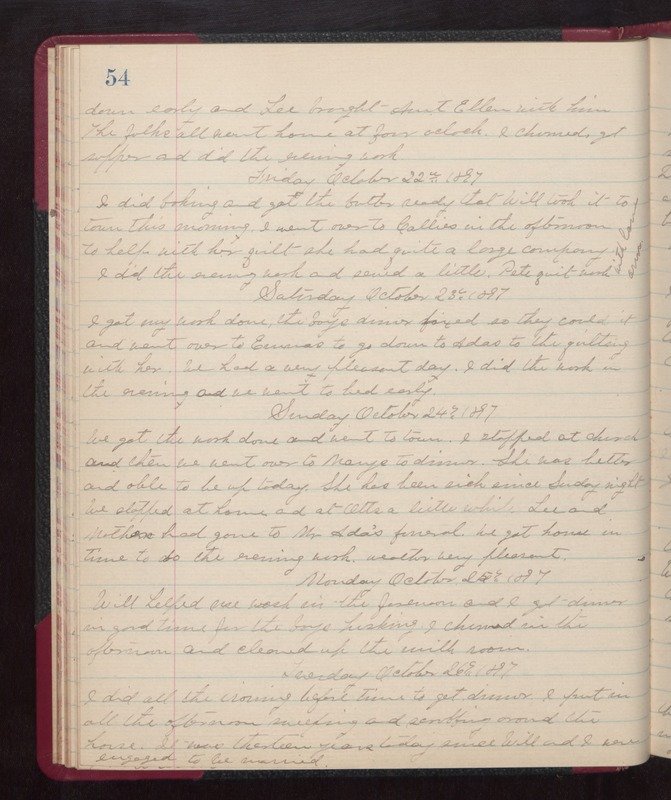 Monday October 25th 1897 Will helped me work in the forenoon and I got dinner in good time for the boys husking. I churned in the afternoon and cleaned up the milk room. Tuesday October 26th 1897 I did all the ironing before time to get dinner. I put in all the afternoon sweeping and scrubbing around the house. It was thirteen years today since Will and I were engaged to be married.